Controls torque, diminishes wheel hop and improves manual transmission shifting. - A must to use with modified motors and if you're heavy footed! - Protects your existing O.E.M. 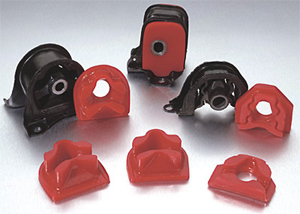 rubber mounts from tearing. - Even works with torn O.E.M. mounts. - Can be removed later for stock running, if so desired. - Installs in just 5 to 10 minutes! - Durable HYPER-FLEX performance polyurethane construction.